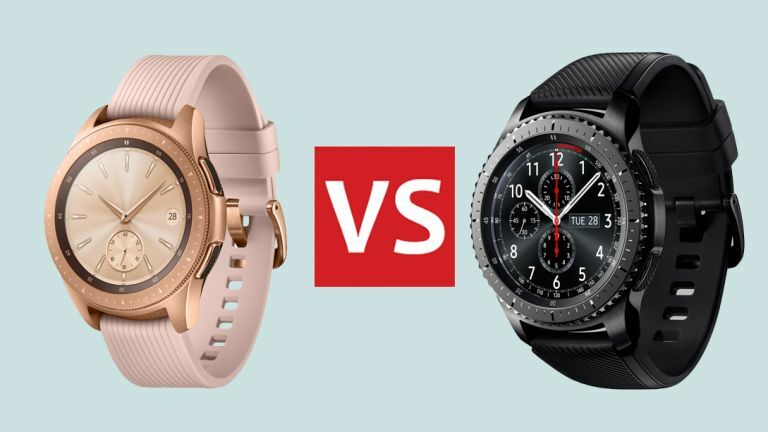 Samsung has just released the Galaxy Watch, but how does it compare to the Gear S3? What's new? Samsung recently released the Samsung Galaxy Watch, a new smartwatch that promises to keep you connected at all times, where ever you go. It's got a new design, long battery life, and a few new features, but is it that different to the Gear S3, a smartwatch Samsung released in 2016? We'll cover the design, specs and the other essential features of a smartwatch so we can see how much Samsung has evolved over the last two years. The Samsung Galaxy Watch is more of an evolution, in terms of design language, when compared to the Gear S3. The Samsung Galaxy Watch comes in two sizes, 42mm and 46mm, whereas the Gear S3 only came in 46mm. That is brilliant news, as 46mm is simply far too big. Three variations of the Galaxy Watch. The Samsung Galaxy Watch also comes with more design options. For a start, you can choose between a Steel, Rose Gold and Black model, then there is a large number of straps to choose from, including Onyx Black, Lunar Grey, Terracotta Red, Lime Yellow, Cosmo Purple, Pink Beige, Cloud Grey, and Natural Brown. In short, the design is improved, but it's not revolutionary, and still lags behind the Apple Watch in our eyes. There's also an issue that even its smallest size, 42mm, is still a pretty large watch, and not suited to smaller wrists. First let's look at the screens. The Gear S3 used a large 1.3-inch, 360 x 360 AMOLED touchscreen. It was bright, sharp, and vibrant - a real pleasure to use. Can you guess what display the 46mm Galaxy Watch uses? A 1.3-inch, 360 x 360 AMOLED touchscreen. The Gear S3 was covered in Corning® Gorilla Glass SR+ glass, while the Galaxy Watch uses (we guess) slightly improved Corning Gorilla® DX+ glass. And the 42mm version of the Galaxy Watch features a 1.2-inch display with the same spec and resolution as the larger one. We haven't seen them yet, but we can assume both will be brilliant displays. The Gear S3 display was brilliant, so Samsung didn't really need to improve here. The 46mm Samsung Galaxy Watch features a Exynos 9110 Dual core 1.15GHz with 1.5GB RAM + 4GB Internal Memory. The 42mm version has 768MB RAM. The Samsung Gear S3 has Exynos 7270, Dual 1.0GHz with 768MB RAM and 4GB Storage. One of the most important specifications is battery life. The 46mm Samsung Galaxy Watch features a 472mAh battery, while the 42mm model has a 270mAh battery. These last upto seven days, and four days respectively. The Gear S3 did a lot of that, but either not as well, or to a lesser extent. Again, it's evolution, not revolution. The Samsung Galaxy Watch is a clear improvement over the Gear S3, but Samsung hasn't suddenly given you a killer reason to buy its smartwatch (at least not on paper). It's very much trying to keep up with the Apple Watch, but is still several versions behind in our eyes. We'll be getting our review device of the Samsung Galaxy Watch soon, so check back in to see our full verdict.